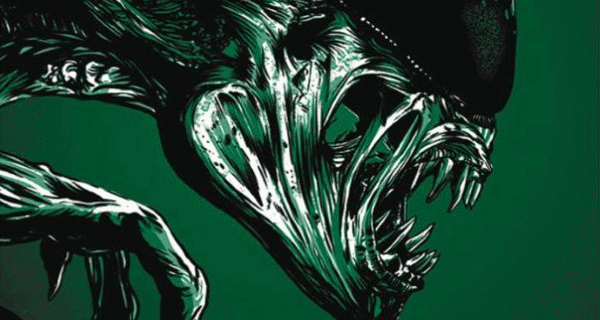 Cover Artwork for Alien: Covenant Collector's Edition Unveiled! 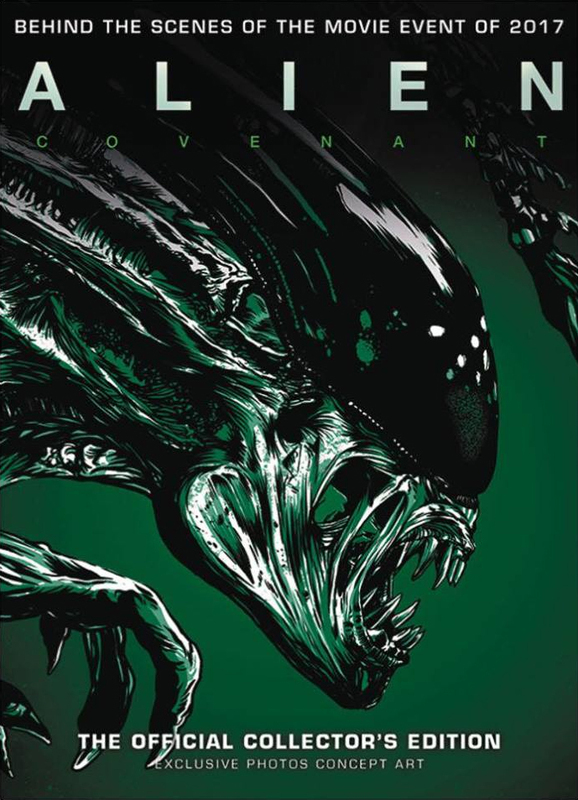 Alien: Covenant – Official Souvenir Edition brings you all you need to know about the making of the blockbuster movie, including stunning photography and exclusive concept art, and interviews with cast and crew including Michael Fassbender (Prometheus, 12 Years a Slave), James Franco (127 Hours, Rise of the Planet of the Apes), Billy Crudup (Watchmen, Spotlight), and Katherine Waterston (Fantastic Beasts and Where to Find Them, Steve Jobs). You can pre-order your own copy from the UK and US off Amazon now! 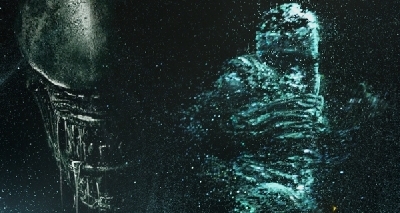 24 Fan responses to Cover Artwork for Alien: Covenant Collector's Edition Unveiled! 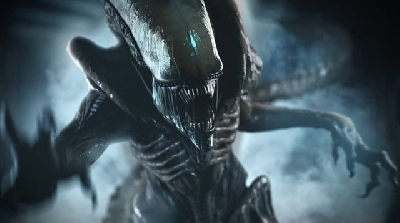 That xeno (Or protomorph, if it is)looks different,more organic and animal like with fang like teeth and claws (even tho the hands look different than the ones shown im the trailer),fitting with the description that was discussed last year about the xeno origin. Love it! 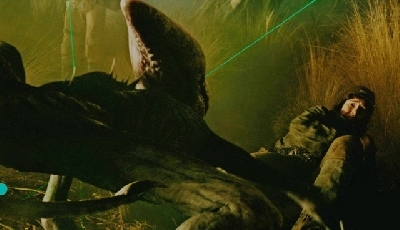 The design is very reminiscent of the Alien 3 creature, but with more jagged teeth. Very organic looking. Not really fond of this cover, looks more like a contemporary comic book take on a generic Xenomorph. 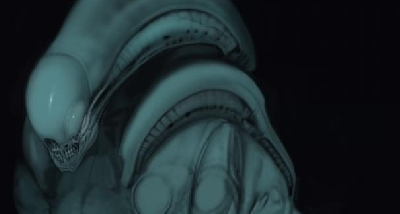 I hope the actual creatures in the movie look more Giger-esque. @easywolf32, you seem to complain about the mobile workings of this site often. I must say you're the only one with those issues as this site works very well on mobile. I use the site mostly through mobile since I'm usually on the go. When you log in, it also removes 90% of all 4 ads on a given mobile page. I'm happy to entertain positive feedback but what you are describing I've since improved 10 fold a year ago. Run our mobile through a page speed test as well, renders relatively quickly. Pop-ups or annoying advertisements I strictly prohibit from our network to specifically improve user functionality. If you continue to experience slow load times or have issues posting I encourage you to email me at [email protected], with appropriate browser / device information so I may offer some assistance. Defently a organic looking fella, with muscle texture,animalistic organic fangs. Good catch Tiago, it does look rather organic by comparison to the Xenomorph. I believe you're right, this is the Protomorph. @Chris, this site gets better every month. I do not know how you do it. I’m down here in Florida now though and I have a punishing job Chris. Anyway I have yet to load the site on the phone and will test it out fast. Chris on with the show as they say! I always imagined the Xenomorph to not have any eyes. Maybe the head has protective layers that cover many eyes and something like radar. set of molecular compounds that can form the right convex curvatures. We know that it has a type of metallic teeth. Our eyes act as lenses as well to a certain power. 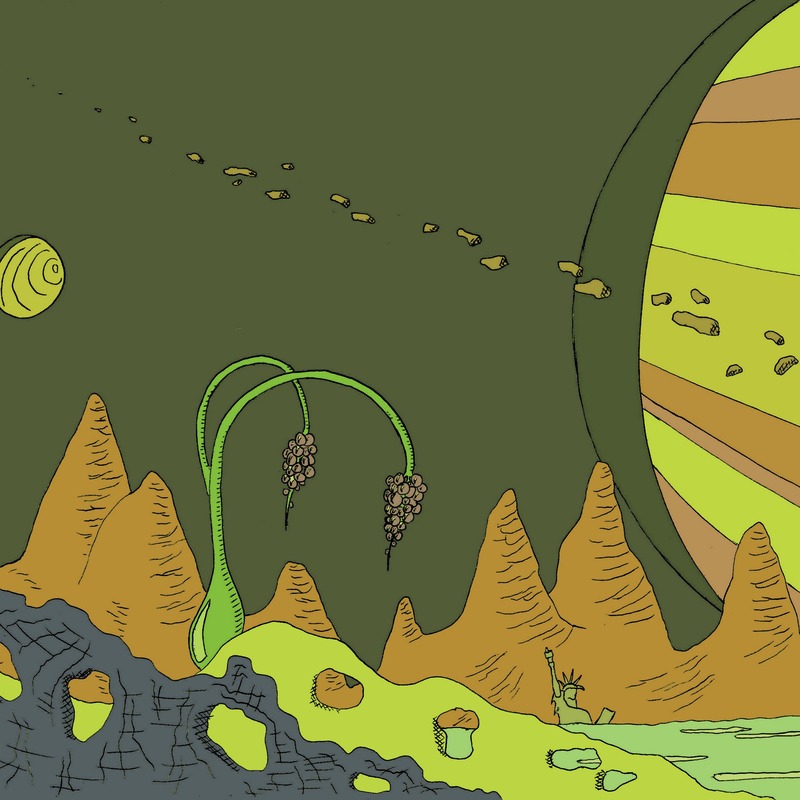 The Alien could have other larger surfaces to create more complex curvatures. We do not know what is happening at the nano layer of the surface of the carapace; however, it may be absorbing photons and transducing them to another type of crystalline bio-mechanical set of lenses and protecting the underlying structure. The entire skull for that matter could be one big eye! That is why you cannot sneak up on them. Those long tubes on their backs could be ears strong enough to sense vibrations form miles away or maybe the atomic movement in the air. We just do not really know what this thing is really capable of doing. Those structures in the Black goo are the bridge for us to think about what happens in this organism. I think the black goo is something way beyond the Higgs field. There is something smaller than the Plank length constant. Maybe it’s a quantum computer mixed with a very fast replicating field. Nature sometimes has these strange tradeoffs. In order to get one reaction there is another but the cost in energy is very fast and depleting. We just do not know how or at what cost the Black Goo is produced or found by the Engineers. Does a Gram take them a hundred years to make. Let us take this just a bit further. 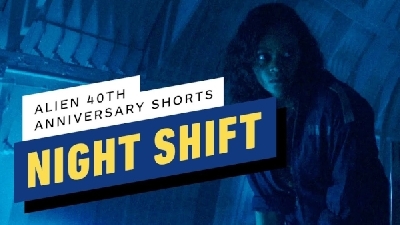 We know that the Alien on the Nostromo grows too fast to that very big size in just a matter of minutes. These are all very valid considerations. What did it absorb or what did it use internally to get to that size. As far as the cover is concerned I am not going to be trying to enforce any strict conventions on others likes or dislikes for purely aesthetic purposes. I think it looks just fine. Perhaps it is more appealing to a much younger audience. I like the way he looks. Sharper teeth and claws are scarier in my opinion. Which brings me back to a post a while ago about the so called hand in the trailer. I think I saw a post awhile ago about the xeno's or neos hand being on glass during the end of the trailer right before he kills the guy in the shower. I really don't think that's a hand. I've watched it multiple times and it looks like a plant to me not a hand. When you watch it again stare directly at that side of the screen and you can see it moves slightly. I'm talking like a split second. It's either a plant or a shadow. I strongly believe that's not his hand. They are going to be very close to these, but image more detail on bigger scale... i think the design will be good it would be similar to like a merger of the AVP, Alien R and Alien 3 Xeno designs. Going to be busy for books.. So we have this behind the scenes book. A Prequel Book set before AC and after Prometheus, and a official Novelization of Alien Covenant. Totally true, BigDave, you hit the target. It's just a drawing. Note the look of the head, and also one of the hands is facing palm side to the camera and looks very like the Trailer Shower Scene Alien. 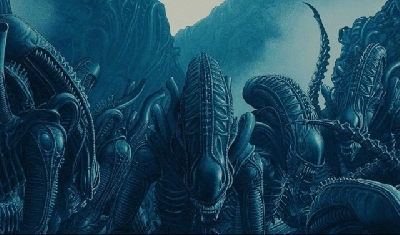 I was informed the new Xeno looks like these in this photo and their lower anatomy is to fit with the Aesthetic of the Queen and to be more polished look than say Alien Resurrection ones. This will explain why they are so fast and nimble and can move around on all fours like a Rat/Mouse only one that can climb walls. imagine a better quality one of these but in a dark grey/black... hands similar to those in the trailer, the feet would leave same bloody prints as in the trailer and the head and face look like in the Cartoon image on the book. Big Dave, this looks like a Xenomorph from Alien Resurrection?